Quick reviews of two niche variations on green: Nomenclature Shi_so and Cire Trudon Deux (II). I am rather late with this one — Shi_so is exactly the sort of crisp and light fragrance that comes in handiest in high summer. Like the others in the Nomenclature line, it's highlighting a synthetic aromachemical, in this case, glycolierral, which is meant to capture crushed ivy leaves. 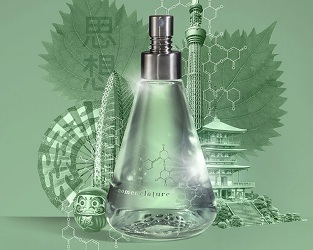 Perfumer Bertrand Duchaufour has whipped it into a lively tonic done in shades of pale green just like the picture, with a bunch of herbs and spices (mint, basil, shiso, cumin, cardamom and lemon verbena are all mentioned in the description) and some tart fruits. It's bracing in the opening, and smells to me first like crushed basil with lemon, then a bit like cilantro. Shi_so stays in an brisk rather than deep register (the description also aptly includes the words "metallic flash") and as you'd expect, it has a completely modern feel. It's green and bright straight through, but the dry down is less sharp, more soapy. It's possibly an acquired taste — the opinions of innocent bystanders were decidedly mixed. I find it fun, and it's definitely worth sampling if you're in need of a new green. Plus, the lasting power is excellent. The details: $165 for 100 ml Eau de Parfum at Aedes or Indigo Perfumery. Moving out of the kitchen and into the woods, we have Deux (II), from Cire Trudon's debut set of personal fragrances. Deux was developed by perfumer Lyn Harris, formerly of Miller Harris, and her description is better than anything I will come up with: "This perfume’s vibrant greenery is a forest painting: pines, juniper and cedar covered in moss and berries on a damp, earthy floor. II is a modern take on eau de Cologne; a green, peppery scent with orange bigarade from Brazil." If Shi_so was high summer, Duex feels more like summer fading into fall — exactly the weather here today. The very peppery citrus in the opening reads as dusky rather than bright, and the pine and juniper, mingling with a light strand of incense, are calming and peaceful rather than brisk. In synaesthesia terms, I see it as a medium forest green shot with flecks of brown. Nicely done and easy to wear, and I'm impressed with the others from the brand as well (look for a review of Bruma on Friday or next Tuesday). The details: $190 for 100 ml Eau de Parfum at Cire Trudon or Barneys, or $110 for a coffret of all five fragrances in 10 ml sprays. 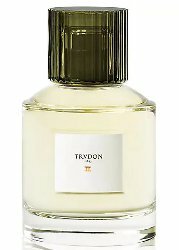 If you buy a full bottle directly from Cire Trudon, they'll include a sample, and let you return or exchange the fragrance if you don't like it (and if you didn't open it). Nice to read that these are good. I am waiting to receive my sample of Shi_so from Aedes (do you find it at all related to diptyque eau de lierre? ), and the CT coffret is tempting but will wait until your review Bruma. Vaguely related, sure — but the Diptyque is a much milder scent. Ok, this is then even more interesting. I don’t like the idea of “very peppery,” but I love the idea of a $100 coffret. I love the Nomenclature imaging and ordered the attractive sample set a few months ago (didn’t include Shi-so). I was disappointed not to find them interesting. But I’ll try anything by Duchaufour once. The coffret is great. Also like that they’ll let you return a bottle. Nomenclature needs a coffret, or travel sizes. I would like to have about 10 ml of Shi_so. But seriously, the people who did not like it REALLY did not like it. I’m duly wary of Shi_so. There are a few Duchaufours that I can’t stand: the original L’Artisan Parfumeur Aedes de Venustas Signature (horrible melding of tea with incense), Fleur de Lianne (the aquatic takes over), and Patchouli Patch (unbearable patchouli). Maybe more as I’ve gotten way behind. I’m so behind it’s no longer an issue — can’t catch up, so why kill myself trying? Some of the ones I haven’t tried have already been discontinued. But once it settled and lost its agressiveness it was just a boring scent. Those Nomenclatures are interesting but just not my style. They have this cleaning product vibe going on. I guess this is what some people call modern. The Cire trudon sounds better though. Looking forward to your Bruma review, the few notes mentioned on their site are promising. That Cire Trudon coffret is smiling to me…. I only sniffed the cap of Deux quickly and it smelled figgy to me (?). I thought they were all nice, though I seemed to think the candles have a more interesting scent range. They certainly have a much wider range. Given that they only did 5, I was surprised that only 1 is what I’d call feminine, when there are so many pretty floral candles in the line.